British pioneer aviator. The first to make a night flight. Photograph, signed. The photograph is a real photograph postcard in the 'Flying at Hendon' series published by the Topical Postcard Co of Winton, Hampshire. It shows Claude Grahame-White seated in the cockpit of what is possibly a Morane-Saulnier monoplane at Hendon aerodrome. With a fine full autograph signature across a light portion of the image and dated in his hand, April 26th 1914. A key autograph of the aviation genre and one that is not often encountered. Approx 5.5 x 3.5 inches. In fine condition. Claude Grahame-White became fascinated with aviation after seeing a demonstration by the Wright Brothers. He acquired a monoplane from Bleriot and taught himself to fly it, making his first solo flight without a single lesson. He quickly became the matinee idol of the aviation world, both in Britain and America and a favourite of the rich and famous, who he often took to the air on joyrides. He amassed a considerable fortune and founded the noted aerodrome and flying school at Hendon. He designed and built several aeroplanes and was influential in the commercialisation of aviation and foresaw the potential for aeroplanes as weapons of war. 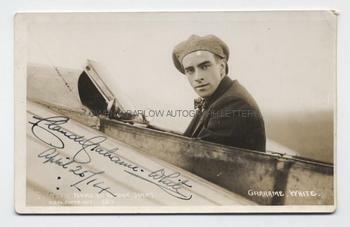 After a protracted legal battle, Claude Grahame-White saw his aerodrome and factory compulsorily acquired by the RAF, after which he typically lost all interest in aviation and turned his considerable talents to other things.